adornable.u is a ground floor direct sales business that is just starting to really become known in the industry. Their full line of jewelry and accessories are beautiful, economical, and functional – often doing double duty with many uses beyond just looking pretty. adornable.u believes in the outward display of inner beauty and every single piece of their impressive product line is simply beautiful. I love the idea of “functional fashion” so when Independent adornable.u Consultant Valerie Butts said she was sending in one of their Chained Bracelets, I just knew I was going to have to hide it from my daughters if I had any chance of enjoying it myself! This adorable Bracelet can give any outfit a bit of sparkle, but can also be used as a hair tie! Now I have been known to keep an elastic band around my wrist for pulling up my hair – this is WAY cuter! I think I need one in every color! I was surprised at how even the chains slid right on and off my hair without pulling! I went straight from work to the gym! It worked great! 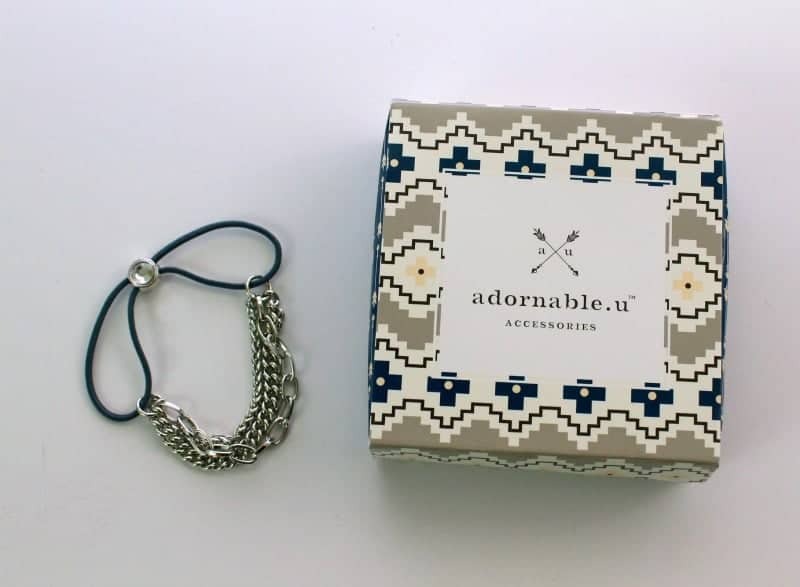 You can purchase adornable.u products directly from Valerie’s website, or earn free and discounted products by hosting an online or in-home social shopping get together. If you are looking for a new, ground floor business opportunity, consider joining Valerie’s adornable.u team and build your business introducing these simple but beautiful pieces to the world!